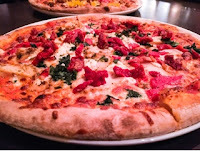 Midtown has a group of restaurants that has operated for years, yet their appeal have diminished with all the new competition, despite having decent food and a pleasant atmosphere. Spacco is one of these restaurants, a place I recall visiting for work functions numerous years ago, dining on appetizer platters and finger foods. They began offering a Groupon deal for a three course meal for four for only $80 - a steal considering most of their mains are $15-$20 (prices included in the post are from the regular menu). We did have to order from condensed offerings, but still had plenty of choices and was a well curated selection off their complete menu. 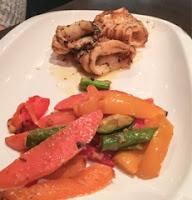 Both of the calamari ($13) were fair sized portions and well executed. The battered version, the typical thin rings, were hot and fresh from the deep fryer. Meanwhile, the grilled version could be charred a bit more but had nice flavours from the lemon garlic olive oil, the vegetables on the side a great addition. 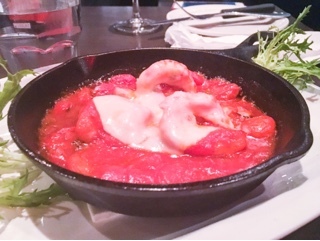 The oven baked shrimp ($13) were thankfully not overcooked and the chunky spicy roasted tomato sauce they sat in great for slathering on the soft complimentary ciabatta buns. Although the arancini ($12) were delicious and in my opinion the tastiest of all the appetizers, the two ping pong sized balls made the starter much smaller compared to other offerings. 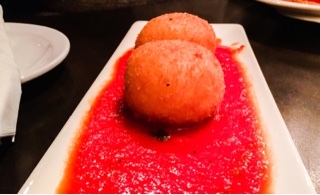 Typically, at other restaurants, there would be three to an order – Spacco you need to consider increasing the number of arancini or the size of each one for this appetizer. Nonetheless, the deep fried risotto stuffed with peas and mozzarella were hot and satisfying, a soft molten middle with the requisite crunchy exterior. 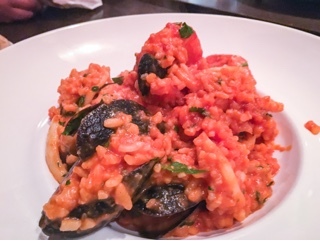 For the mains, the seafood risotto ($20) was terrible – the rice extremely mushy and is questionable if it was even made with the Arborio variety. There was a fair amount of seafood (shrimp, scallop, calamari and mussels) but despite the menu describing the mussels as “fresh”, they were gritty and tasted off to me. The penne trecolore ($18) was better, the pasta in between the al dante and cooked through state but tossed in a tasty tomato cream sauce. 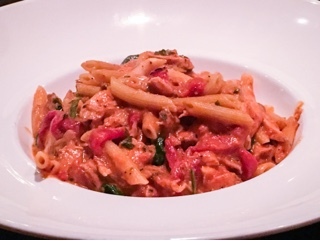 Mixed into the pasta was plenty of chicken, spinach and roasted red peppers to provide the “three colours” from the dish’s name. 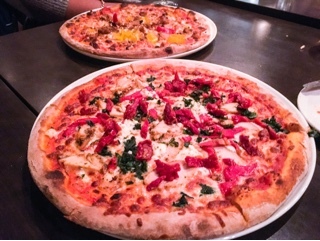 With the wood-burning oven prominently situated in the open kitchen, it seemed like a safe bet that the pizzas would be good. 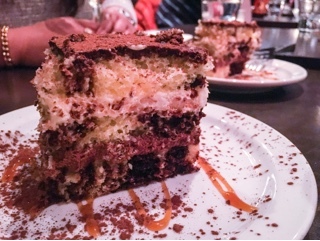 We ordered two to share, the culo rosso ($16) and campagnia ($17), both delicious and prettily presented. 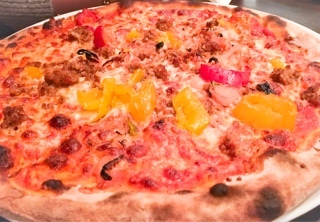 Indeed, the culo rosso had a very spicy kick from the hot banana peppers, so much so that it momentarily renders your tongue numb making the sausage and caramelized shallots non-existent. But, if you like the heat, it’s a great pie. On the other hand, the campagnia is much tamer topped with chicken, roasted red peppers, spinach, sundried tomatoes and a fair amount of creamy goat cheese. 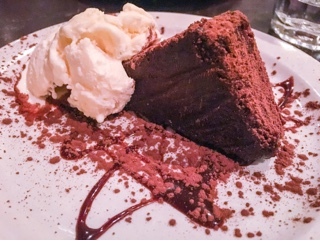 The only easy decision is dessert – there are two choices, a sweet and moist tuxedo truffle mousse cake or dense and sugary iced chocolate brownie with ice cream ($7). Neither are fantastic, yet tasted fresh and since they’re both so decadent, leaves you satisfied with a few tastes. Overall, we were all pleasantly surprised with the quality of their food for the price we paid ($20 per person). Although there wasn’t anything outstanding, the dishes were executed better than chain restaurants and the atmosphere cheerful and conducive to sharing bottles of wine without fear of becoming too loud. Best yet, after the meal, you can always venture to their lounge area and continue the night with more drinks and a game at one of their seven pool tables.